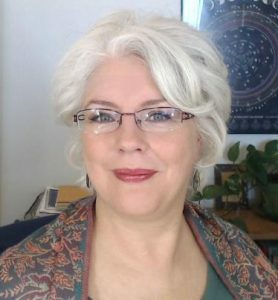 Hi, I’m Karen White and like so many others, I read Linda Goodman’s book on Sun Sign astrology when I was a kid. That was the beginning of my passionate love affair with astrology. I read Linda’s book over and over and was even able to guess a person’s Sun sign…sometimes. I wondered why it didn’t work all the time. I also didn’t possess many of the personality traits she said my Sun Sign (Aries) had either. But, it worked often enough that I continued reading about Sun Sign astrology. I never dreamed I would end up being as involved as I am today. Isn’t it funny how we never see it coming? I found myself searching bookstores and libraries, spending whole days there reading astrology books in general, and Moon sign descriptions in particular, trying to figure out what my Moon sign was. I narrowed it down to two signs, Pisces and Libra. Without hesitation, both my husband and my closest friend thought that Pisces Moon fit me best. Shortly after that, I met a fellow lover of astrology. She knew much more about astrology than I did, and she cast my birth chart for me (thank you, Carol!). My horoscope showed my Moon sign was indeed Pisces! Amazed, I plunged headlong into studying astrology, reading practically anything I could find. Intrigued, my love affair with astrology continued, and I wanted to know everything! One of the first books I read after I had my horoscope in hand, was Astrology, Psychology, and the Four Elements by Stephen Arroyo. His book explained and offered solutions to a knotty problem in my marriage that marriage counseling hadn’t helped! Impressed with the healing ability of astrology, I obsessively researched how to read my birth chart. As a psychology major in college, naturally, I devoured the modern psychological, philosophical type of astrology books. I decided I would incorporate astrology into my practice when I became a therapist; I wondered how any psychologist was able to practice without it. As my love affair with astrology deepened, however, it eclipsed my interest in psychology. My first astrology teacher (that wasn’t a book), was Arthyr Chadbourne, whom I met at a monthly Astrology meeting. He introduced me to ancient astrology before astrologers used horoscopes. A very creative astrologer and patient teacher, I had the good fortune to learn his Sunset Method, which showed me how the ancient Babylonians viewed the night sky before the use of personal horoscopes. I loved the monthly astrology meetings, avidly interested in whatever the visiting guest speakers were teaching. Soon, however, after starting to give readings for people, I was disappointed that they were not that interested in the psychological and philosophical aspects of their birth charts. I was stunned and surprised. I thought everyone wanted to understand themselves on that level! They wanted to know if they would marry the guy they were dating. Or if they were going to be famous, or if they would get a job, or lose the job they had — all questions about the everyday stuff of life. Disillusioned, I dumped my love affair with astrology. Little did I know that my client’s desire for more concrete answers was to take me far deeper into my love affair with astrology than I could ever have imagined. About two months away from astrology was as long of a ‘break-up’ as I could stand. While browsing a metaphysical bookstore, a book seemed to jump out at me. That book was The Real Astrology by John Frawley. This book electrified me and turned my world upside down. I’ve never met John in person, but he has been one of my most valued teachers. His books are revolutionary, and the astrological tool of Horary Astrology enabled me to answer the concrete questions clients had been asking me. I studied his books and took a Horary Astrology email course with one of his best students, Branka Stamenkovic. Well, after finding Horary astrology, I was a total goner, truly, madly, deeply hooked into my love affair with astrology. I was happy to learn that there is a definite spiritual and psychological component to Horary astrology too, it’s not just for the mundane aspects of living on earth. Having long been interested in Ayurvedic medicine, yoga, meditation, and Eastern philosophy, it was inevitable that I would become involved in the techniques of Vedic Astrology. Still, I noticed that while it was head and shoulders above modern western astrology in its ability to give concrete, accurate answers to specific questions, it wasn’t very consistent. It got closer with Systems Vedic astrology, but the angel of astrology must have been looking out for me once again because a fellow astrologer recommended that I learn Vedic astrology from Ernst Wilhelm. Ernst is indeed a remarkable scholar, astrologer, and teacher. His research and techniques have entirely restored my trust in natal astrology, and while I still have a great deal more to learn from him, I now feel I can be of real service to people. He teaches Vedic techniques but uses the tropical zodiac and the sidereal zodiac for lunar Nakshatra techniques. In testing it out for myself, I agree that the tropical zodiac works more consistently and reliably than the sidereal zodiac does for most Vedic natal techniques. For those of you interested in the technical explanation of this method, (or to learn Vedic astrology from Ernst), check him out at vedic-astrology.net. I look forward to meeting you and sharing with you everything that I know, and love, about astrology so far. If you want to know something concrete and straightforward about your life, or if you are a spiritual seeker and want to understand yourself and others more deeply, you can schedule a consultation with me. Stay tuned for the next chapter in my lifelong love affair with astrology! Now that I’ve been a full-time practicing astrologer for over seven years, there is a new chapter I want to add to this story. While most of my clients want concrete answers to everyday issues, many want to understand the meaning and purpose of their painful life experiences. Usually both in the same consultation. I love doing both kinds of astrology and am grateful my astrological education took the winding path it did. I’ve come to believe that while it’s important to be able to make predictions, something that is intrinsic to being an astrologer, I think that astrology’s highest use is in helping a person to find meaning in their experiences. As well as provide perspective on life passages, insight on how to have better relationships, and clarity on their life purpose. Astrology is an excellent perspective tool. What feels overwhelming becomes manageable, what’s bewildering becomes clear, and what’s meaningless becomes meaningful and, therefore, bearable. Through the symbolic language of astrology, everyday life becomes re-enchanted with the sacred and the divine. A transformative spiritual path in and of itself, astrology is a complete philosophy that shows us much about how to live as fully, and as profoundly, as possible. I love that astrology is called The Science of Light. Please email me with any questions, I will reply to you within 24 to 48 hours. *Please know that some links on this site are affiliate links. That means I earn money if you make a purchase using my link. This in no way affects my book, product, or service reviews or suggestions. I only recommend products I know, love, and trust.